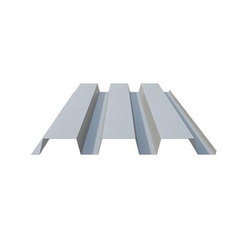 Deck Sheet sections are cold rolled formed sections used as a permanent shuttering framework or as part of RCC composite roof slab which results very economical to support finished roofing material or serve as a permanent form and/or positive re-enforcement for concrete floor slabs. 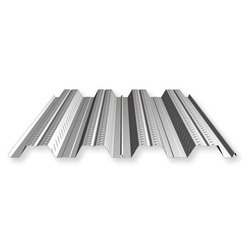 Deck profile metal sheets are used extensively for decking in industrial and commercialbuildings. Deck sheets were used for mezzanine flooring which provides additional storage space in any new or existing building. Mezzanines create additional floor space by going up under the same roof which saves not only the cost of new construction but also saves the time to construct the new shed since all components arrive prefabricated and ready for immediate installation. The custom designed modular Mezzanine systems can be configured to your unique building requirements and our lightweight beams facilitate installation over existing shelving, machinery, or work areas. They are easily integrated with pick modules, vertical lifts, conveyors, and racking or shelving systems, and are also made to be built around machinery or tanks in production areas. Our company – Pioneer India provides the clients with Structural Steel Deck systems which are cheaper to install if compared with reinforced concrete. It is not just cheaper, but it also saves time and resources used in installation of roof. Structural steel decks offered by our company are manufactured using high quality materials which we procure from reputed vendors in the market. Our products are supplied with promise of durable performance. 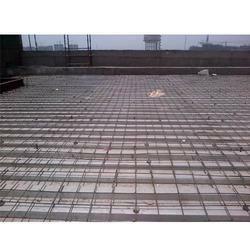 Pioneer India is offering structural steel deck, structural steel deck india, structural steel decking, structural steel deck systems to their satisfied customers being the leading structural steel deck manufacturers, structural steel deck systems manufacturers. Looking for DECK Sheets Supplier India ?